Areya Street is an old featured street in the Ga Er Ancient City. A legend tells that during the period of the Shule Kingdom, a flood that was unexpected in a hundred years attacked the city. The residents in the city flocked to the high places. When the city was to be drowned in the flood, a fissure appeared in the ground that the water flowed along the fissure to the distance. Consequently, the residents survived and the ancient city of Kashgar was preserved. Nowadays, the fissure is Areya Street. Areya means that there is a river in the middle. Areya Street is 600 meters long, offering several types of bazaar to explore. You will find flowerpot Bazaar, Kantuman (a type of Uyghur farming tool similar to spade) Bazar, woodware Bazaar, traditional Uyghur medicine Bazaar, seasoning and tea Bazaar, pottery bazaar and embroidered hats Bazaar. 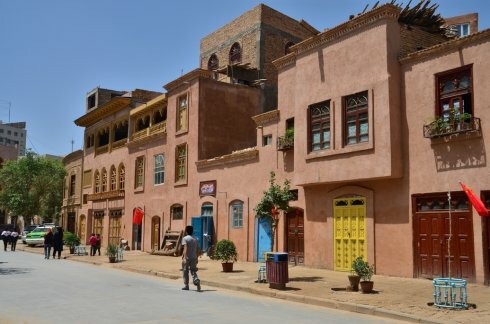 The street is a great place to experience Kashgar history and culture and Uyghur ethnic customs. The street is home to around 60 shops. All the goods at the shop are handmade by the owner. They look fairly exquisite. Hasap Bazaar Mosque, Yage Bazaar Mosque, Kebok Bazaar Mosque and Jumah Mosque are situated on the street. Except the Kebok Bazaar Mosque, the other 3 mosques are in use at present. The doors of the houses are carved beautifully. Most of the buildings on the street are several hundred years old. They all are built with immature soil. On the street, you will experience the authentic local lifestyle. The elders always play local unique instruments very well. If you are interested to explore the local life, the best time to visit is during the daytime. If you are planning to visit the street for photography purposes, the best time to visit is during the sunset. As Areya Street lies in the Ga Er Ancient City which is situated near the Id Kah Mosque, you could get to the mosque first and then walk to the ancient city. Therefore, there are a few options. Rent a vehicle to the ancient city. This is the quickest and most direct option. Take Bus 2, 7, 8, 13, 22 and Bus 28 to the Stop of Ai Ti Ga Er (艾提尕尔站). If you would like to take photos of locals, please ask them if it is OK with them. Please wear the sunscreen cream, sunglasses and the like as it is dry around the year in Kashgar. Interested in visiting the Areya Street on a Tour? Wendy Wei Tours offers a variety of different packaged tours as well as custom tours including Areya Street, among other attractions and destinations. To find out more, please visit our Tours page or Contact Us directly to find out more.